Hi, I’m Sarah! Thanks for visiting! I hope you stay a while and get inspired to cook at home too! I would love you try out some of these recipes, and comment on how you went, what you thought! 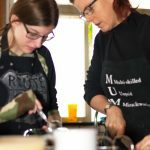 You can also follow me and my cooking adventures on Twitter, Instagram, Facebook and Pinterest – just click on the buttons on the side menu … I’d love to hear from you! If you’re in the Salt Lake City area, you can also find me and my baked treats at the South Jordan Farmers Market, every Saturday morning (8am-2pm) from August to October. More details here. Being in the kitchen is how I relax at home. I really love cooking. I love cooking for my friends, my family, my co-workers, random people on the street. Anyone. My dream is to have a full-time job in the food industry somewhere – seeing people enjoy food that I’ve made really makes my day! I am gluten and dairy intolerant, with a very special snowflake stomach. I have found over the years that I do better with a more Paleo-based diet (reducing legumes and grains as well as processed sugars), but still enjoy food that doesn’t follow those guidelines. 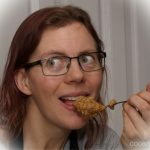 And this blog reflects a lot of my journey through discovering what works for my stomach … feel free to comment and give me any advice on any post or recipe! Always gluten-free, mostly dairy-free recipes that anyone can cook at home. 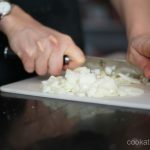 I want to give everyone the opportunity to make delicious food, especially for others who have some food intolerance. These recipes are mostly healthy, but they are always tasty. And there are many, many combinations of chocolate and peanut butter …! ‘Contact me‘: feel free to contact me privately if you want to give me encouragement, suggestions or if you wish to work with me!